This is probably the newest (and certainly most exciting) estate in the Saumur-Champigny appellation, even though the age of the vines average around 30 years. It was founded in 2005 by Philippe Porché and his wife, Agnès who purchased the vineyard and modest farmhouse from the estate of a deceased cooperateur-vigneron. 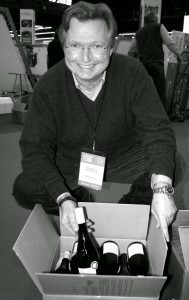 A long-time wine enthusiast, Philippe originates from the Vendée, but has worked for most of his 50-odd years in Saumur. The wines are made under the guidance of young viticulturalist, Jérome Callet in a modern cellar, which would not look out of place in the Napa Valley, located on top of a limestone ridge over-looking the Loire. With one notable exception, all of the vines are located in the commune of Parnay, with no single parcel more than 500 metres from the cellar. Unusually for the region, the domaine has a significant amount of relatively old vine Chenin Blanc planted. Since white Saumur-Champigny doesn’t exist, these default to the catch-all appellation of Saumur. In addition, there is one parcel of Chenin sourced from within a true clos located in the renowned commune of Brézé. It is a vineyard that Philippe originally rented but, given the quality of the fruit that the site has delivered to date, he has now purchased the vineyard outright. It’s easy to notice the theme here, with the names and imagery of the range based on the concept of pre-revolution French hierarchy. Of the whites, La Jouvencelle is raised in 2-3 fill barrels for nine months, whilst her ‘older sister’ La Dame, is fermented and aged in new and second fill barriques and larger foudre. It comes from a specific clone of Chenin, planted close to the Medieval church above Parnay, that gives it a great aromatic quality; almost Alsatian in style. The 2012 was awarded the Coup de Coeur in the latest Guide Hachette. Le Troubadour is a dry Saumur Rosé which, until recently, was sold under the Cabernet de Saumur appellation. There is a single tank produced each year, so production remains limited. The wine has structure and texture and the presentation would appeal those who looks towards the Côte d’Azur to source their summer drinking. The reds start with Le Page and is designed for delicious and immediate drinking. That’s not to suggest the wine is not durable; it has sufficient structure for it to last a decade or so. Raised in tank, Philippe insists on keeping aged stock too, so there are usually mature examples available too. Equally impressive is Le Prince which represents a single tank sourced from older vines in the parcel of Les Hautes Varennes. The 2011 illustrates what the 2014 might well evolve into. There is also the obligatory oak-aged example in Le Roi. From the ripe 2009 vintage, it’s impressive but it’s not Saumur-Champigny.